The effects of using any specific type of cannabis may be very different from person to person. For that reason, each patient individually will need to find out what variety of medicinal cannabis best suits his/her needs. Furthermore, the optimal mode of administration (oral or inhalation) will need to be determined. Cannabis plants come in a wide range of shapes and sizes, with clear differences in characteristics such as smell, color, growth rate, and bud size. Many medicinal users claim they also differ in therapeutic or medicinal effect. These various types of cannabis are commonly called varieties, strains, or cultivars (cultivated varieties). Through the efforts of countless breeders worldwide, an enormous diversity of varieties has been developed, and already more than 700 varieties have been identified. Although some varieties have become well known in popular culture for their specific therapeutic effect, it is hard to generally say that some strains are more medicinal than others. In theory, all cannabis varieties have the potential to be medicinal, but it is not fully clear yet how such popular claims can be linked to differences in chemical composition and therapeutic effects. Which variety is most suitable to treat certain conditions depends on the specific complaints. Furthermore, there may be large differences in effects even between two patients with a similar medical condition. For that reason, finding the optimal variety may be somewhat of a trial-and-error. Together with the doctor, and supported by information provided by the OMC, it can be determined what variety of cannabis will work best. The different varieties are discussed below. These two varieties both show a high presence of THC, with practically no CBD present. Please note that the variety Bedrocan was named after the company (Bedrocan BV), which may lead to confusion. When consuming these varieties in the form of inhalation (smoking or vaporizing) a large amount of THC is quickly absorbed by the body. This seems to be mostly suitable for the treatment of neuropathic pain, and for acute complaints (fast action = quick relief). Disorders such as Gilles de la Tourette syndrome and glaucoma, as well as weight loss, are also preferably treated with high levels of THC. Bedrocan is the most potent product currently available, with about 19% THC present. The variety Bedrobinol is somewhat milder, with a THC content of about 12%. When using these varieties in the form of a tea instead of inhalation, less THC is released from the plant material. This makes tea less ‘potent’ in the sense that less psychotropic side-effects (getting high) may be expected. However, the presence of other plant derived chemicals, such as THC-acid, is actually much higher compared to inhalation. Perhaps because THC-acid has an effect on inflammation, tea made of varieties Bedrocan or Bedrobinol is often used by MS-patients. Furthermore it seems effective in treating nausea and vomiting associated with cancer-treatment. The use of cannabis as a tea is recommended for patients who are sensitive to the effects of cannabis, or who use cannabis for chronic ailments over long periods of time. Variety Bediol has a relatively low THC content, in combination with a significant CBD content. The cannabinoid CBD has effects on the immune system, and helps to reduce the side-effects of THC (anxiety, dizziness, euphoria). The variety Bediol is therefore recommended when the presence of THC is needed to treat an ailment, but the patient is sensitive for the effects of THC. Furthermore, Bediol may be the right choice for conditions where the immune system plays an important role, such as inflammation. Based on large scale clinical trials, there are strong indications that therapy with a combination of THC and CBD (such as in Bediol) is effective in treating MS-related pain. Because CBD does not seem to be very well absorbed in the intestines, it is advised to administer Bediol in the form of inhalation. All varieties discussed above are genetically derived from cannabis of the Sativa-type. In general, Sativa-type cannabis has a strong psychotropic effect, which means it may easily make you feel ‘high’. In contrast, the Indica-types of cannabis are more mellow, and will result in a more relaxing effect. Scientifically, the main difference between Sativa and Indica types is believed to be in the composition of the terpenes. Variety Bedica has been developed from such an India-type cannabis, on request by patients. 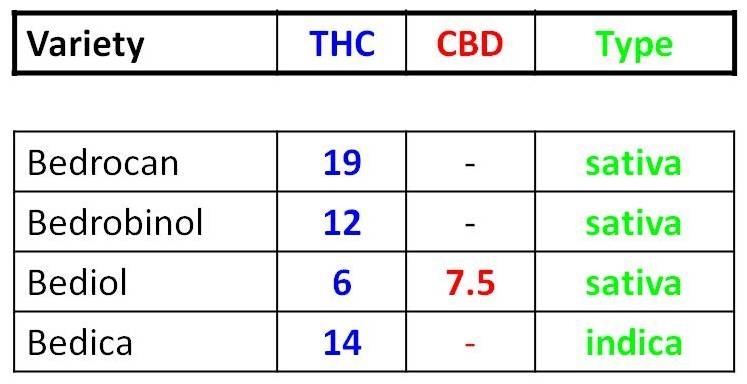 The THC content is moderate (14%) and the CBD content is very low (<0.1%). The terpene composition of Bedica is significantly different from the other varieties, with a notably high concentration of the terpene called Myrcene. Whole, dried flowers – (buds) officially named Cannabis flos, after the proper (Latin) scientific name for dried flowers. Whole flowers have been made available because this is the form most patients have traditionally used cannabis. Ground up flowers – this product is essentially the same as the above, but the material has been ground up (or ‘granulated’) in pieces up to 5 mm. This product is available under the name ‘granulate’. 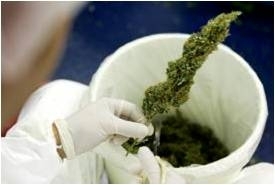 The ground up flowers are offered as a convenience to patients, as the material is easier to handle and dose. The chemical composition of a cannabis variety does not depend on the form it is available in (Flos or Granulate). The only difference is in the ease of use, and the preference of the patient.